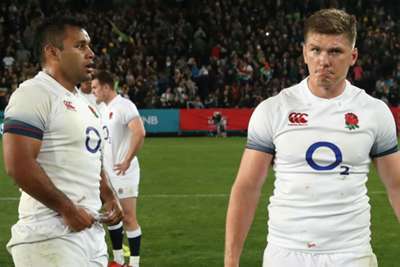 Billy Vunipola has staunchly defended Owen Farrell's leadership skills after England's Six Nations capitulation against Scotland. Eddie Jones replaced Farrell, sole captain in the absence of Dylan Hartley, and said the fly-half had "lost a bit of his edge" after Scotland roared back to retain the Calcutta Cup. The number eight told Omnisport: "The media is up and down and sometimes you can't believe the hype. I support Faz and what he's brought to the group, the way he's led us. "It's just unfortunate that we didn't get the results that we wanted but it's coming, I believe that it will, I have faith that it will, we just have to show everyone else." He added: "It was only a few weeks ago that he was one of the best [fly-halves in the world] and now obviously we have one bad half and now everyone's questioning, is he still our captain? "That's the pressure that comes with playing for England and that's just something that we have to learn from, same for him. "He has my support and I'm just in the team to try and help in any way that I can and he's doing the same but leading us." - Vunipola was speaking at a coaching session he was leading with fellow Saracens and Harlequins players on behalf of Land Rover at Beaconsfield RFC.